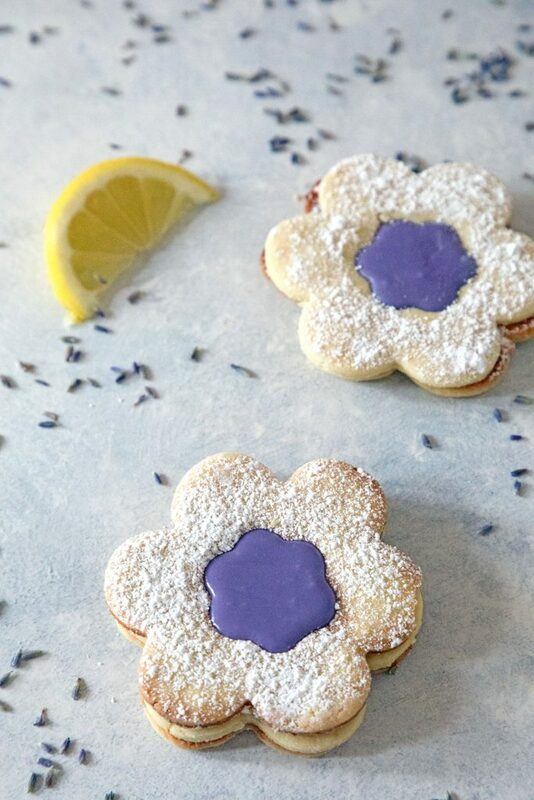 Lavender Lemon Cookies take the classic linzer cookie and give it a spring refresh with bright citrus and floral flavors. I can’t even tell you how happy I am about this glorious weather we are currently experiencing. Hooray!! And I have no patience for anyone in New England who is complaining about the heat. Let’s just enjoy it for a little bit and be happy that we’re not freezing cold and trudging through mountains of dirty snow, OK? But then, I guess that’s easy for me to say considering my office at work has been approximately 2 degrees this week, so stepping into the 90 degree heat feels splendid after sitting in an igloo for hours at a time. I’m also the kind of person who could spend all day in the extreme heat and be perfectly happy, so I have a hard time understanding how people hate it so much. The other day, I had a few minutes to spare for a lunchtime walk in the heat and after I warmed up, I was craving an ice cold lemonade. I ended up getting a lemonade green tea (so good!!) 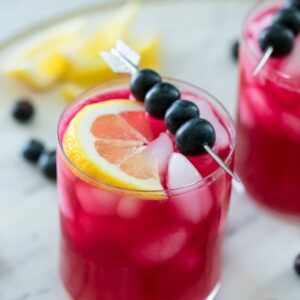 and started daydreaming about my Lavender Lemonade Mojitos (clearly what you should be dreaming about in the middle of your workday). 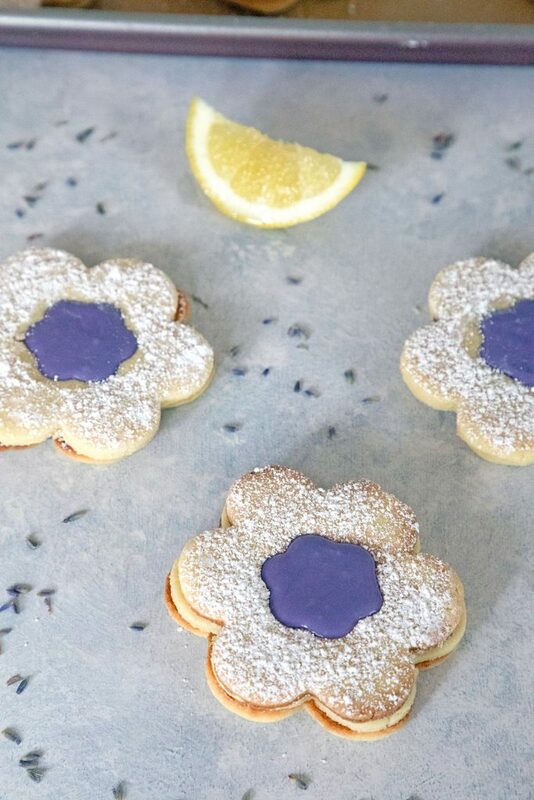 Which coincidentally, is the perfect drink to accompany these Lavender Lemonade Cookies. I based the cookies off a classic linzer cookie, but gave them a bit more lemon flavor and filled them with lavender icing instead of jam. I love so many things about these cookies, but mostly the flavors and the colors. Lavender and yellow were my wedding colors (along with grey) and these would have been such lovely favors (laughing at the thought of myself DIYing hundreds of cookies before my wedding. That’s almost as funny as the fact that I wanted to make hundreds of paper flowers for it). There’s nothing difficult or very time-consuming about the cookies except that the dough and the lavender milk need to chill a bit. 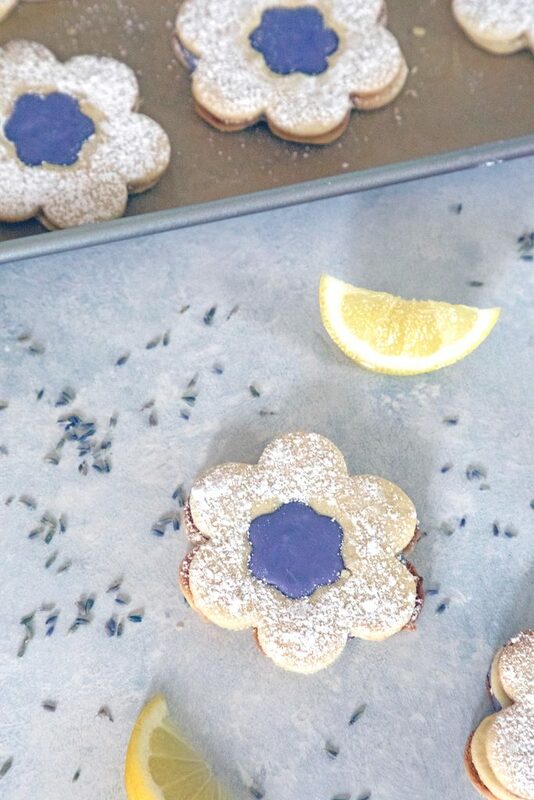 You can, of course, make these lavender lemon cookies in any shape you choose, though it helps if you have that same shape in both a large and small cookie cutter. I went with a pretty little spring-like flower (my cookie cutter set is from Wilton and can be found here). While lots of people love lavender flavored treats, I know that overly floral flavors can bother some people. One of the awesome things about these cookies is that the lavender flavor is present, but also pretty discrete. It’s not all up in your face like, “hi, you’re eating flowers right now.” It’s nice and light and set off by rest of the tart and sweet cookie, which is why lavender lemon is the most perfect flavor combination. Though to be honest, despite making these cookies twice now, I’ve only had the opportunity to actually enjoy two of them. Why? Because Chris has eaten the rest of them. He seriously loves them! And that makes me so happy since he’s not the kind of guy who will just go crazy for any food you put in front of him. But with these cookies, I noticed that every day when I got home from work, a few more cookies were gone from the Tupperware (and… that the Tupperware was left half open, which drives me crazyyyyy, but that’s beside the point). Until they were gone. Which means I”ll definitely have to make these again soon. Though I’m so into the idea of linzer cookies now that I want to make a million different varieties. Come fall, I’m already planning to make little pumpkin linzer cookies with a cinnamon pumpkin butter filling. You can hold me to that. But don’t rush fall here too quickly… I need a lot more time in the heat. So, excuse me while I pour a nice tall Lavender Lemonade Mojito and sit on my deck in the sunshine with a batch of these Lavender Lemon Cookies. OK fine, in reality you’re probably reading this while I sit in my 2-degree freezing office, but I can dream that my life is way more luxurious than it actually is, right? 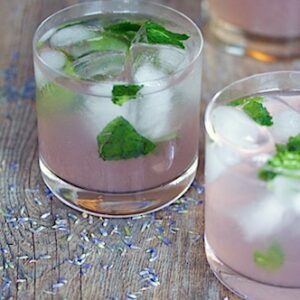 Are you a fan of lavender flavoring? 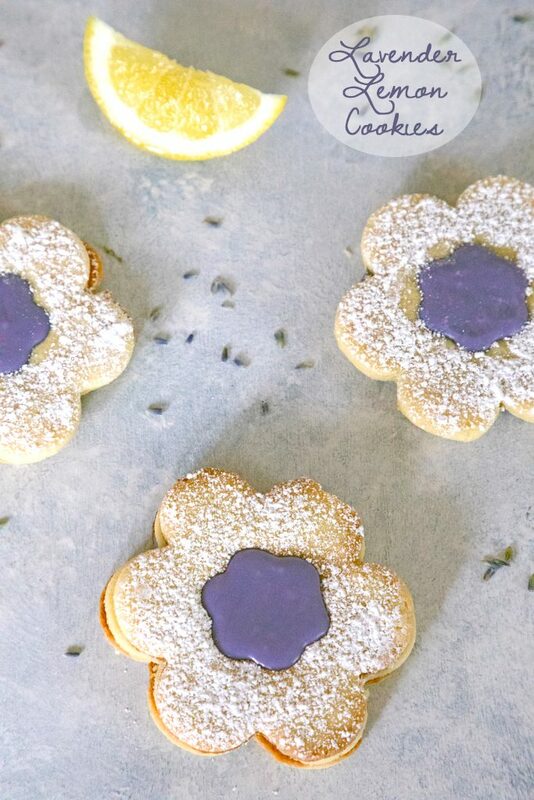 Whether you think you are or not, I’d love for you to try these Lavender Lemon Cookies! In the bowl of a stand mixer or in a large bowl with a hand mixer, beat together butter, sugar, and lemon zest until light and fluffy, about 3 minutes. Beat in egg yolk, vanilla, and lemon juice. In a separate large bowl, whisk together flour, almond flour, and salt. 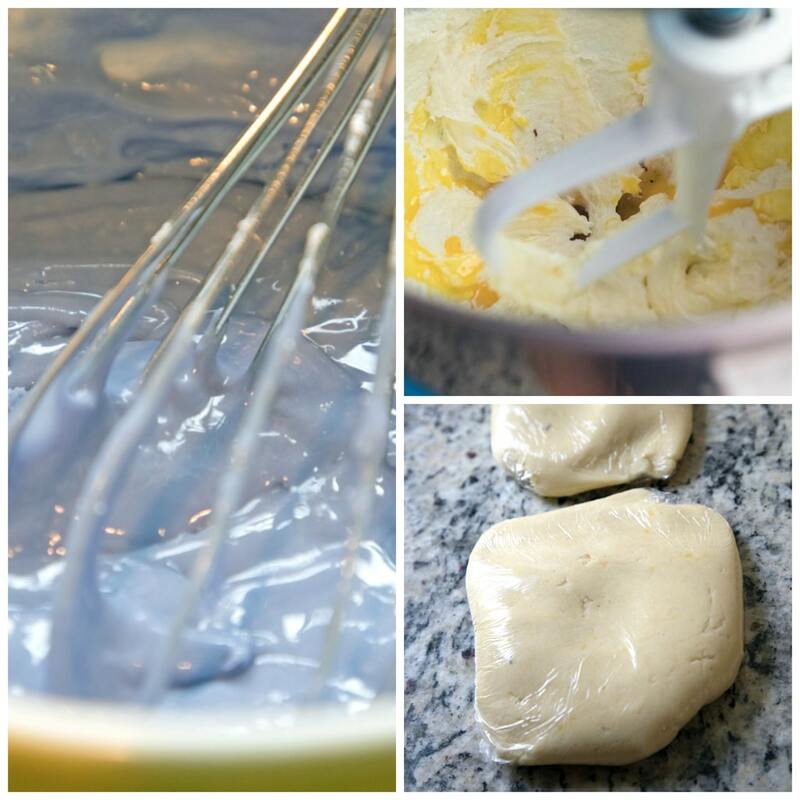 Add flour mixture to the wet mixture and mix until just combined, taking care not to over-mix. Divide dough in half and pat each half into a disc. Wrap dough in plastic wrap and place in fridge until firm, about 1 hour. On a lightly floured surface, roll one disc of dough out to be about 1/4"-thick (leave second disc of dough in fridge). Cut out cookies with a medium or large cookie cutter (2 1/2" is recommended) and transfer to a parchment paper-lined baking sheet. Be sure to re-roll and dough scraps to cut out as many cookies as you can. Place cookie sheet in fridge for about 30 minutes and take second dough disc out. Roll second dough disk out to be about 1/4"-thick and cut shapes with same cookie cutter. Transfer these to a second parchment paper-lined baking sheet and use your smallest cookie cutter to make a cutout in the center of each. Place this cookie sheet in fridge for 30 minutes to chill. Bake both sheets of cookies for 8 to 10 minutes, or until the edges are just beginning to turn golden. Let them cool for 5 minutes on the pan, before transferring to a wire rack to cool completely. Place the cookies with the holes in them on a cookie sheet and sift confectioners' sugar over the top. Turn the remaining cookies flat side up and spread about 1/2 teaspoon of lavender icing into the center. 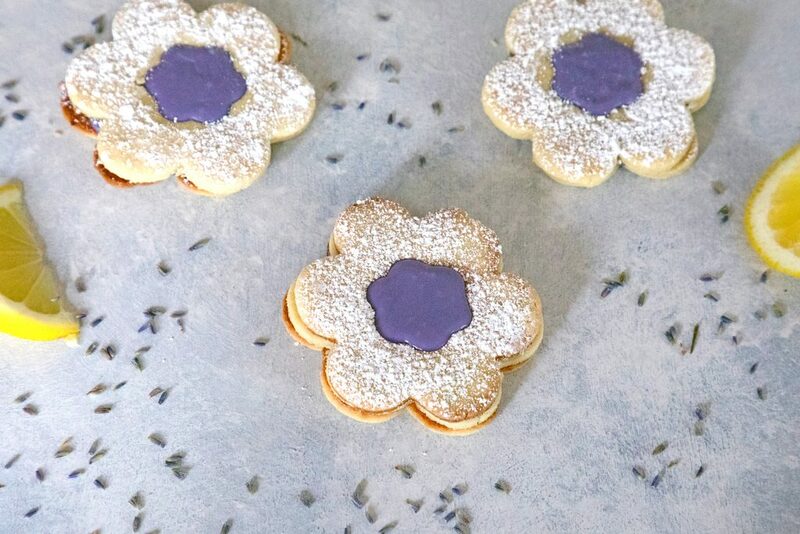 Top lavender icing cookies with the sugar-dusted cookies. 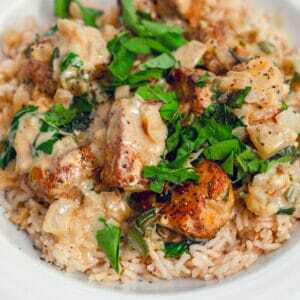 In a small saucepan over medium heat, bring milk and lavender to just a boil. Remove saucepan from heat and let lavender steep in milk for about 10 minutes. Strain and discard lavender. Let mixture cool to room temperature. Place 6 Tbsp of the lavender milk mixture into a medium bowl and whisk in confectioners' sugar until smooth. For a thinner icing, add more lavender milk, 1 tsp at a time. Add food coloring until you reach desired shade (I used one drop red and one drop blue). 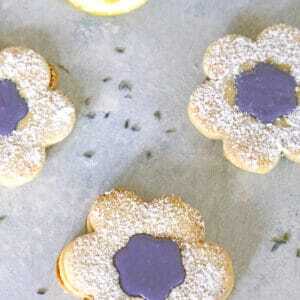 12 Responses to "Lavender Lemon Cookies"
I guess you can gather I love all things Lavender. Enjoy your summer weather. It’s full blown winter here. I also cannot stand it when containers aren’t closed properly. It is hot here, but I’m not complaining! Well, not yet anyways… ask me how I feel about the heat at the end of August. Lol. Anyways, I adore linzer cookies, so I loooove that you fancied them up! Lavender and lemon is such a yummy combination! I need a few dozen of these, STAT! Cheers, friend! I’m glad you’re having some warm weather out there. I could spend all day in the heat too; one of my pet peeves in Phoenix is that everywhere you go the AC is cranked so high you need a sweater indoors. And these have to be the prettiest and most spring-tastic cookies I’ve ever seen! I love the lavender lemon combination. And I can’t wait to see your pumpkin version! These cookies are so lovely! I enjoy Linzer cookies as well but the flavors you’ve combined here are refreshing. I had to chuckle over your comments regarding hot weather. I’m one of those who doesn’t tolerate it well, but the sun shines all year long where I live. It gets incredibly monotonous to someone like me who loves a good rainstorm and who has been giddy the few times in life when snow has actually fallen. The hottest place I’ve been is Las Vegas in the dead of summer. 120 degrees. Baking, searing hot. Thanks so much for visiting my blog recently. I appreciate it and am glad to see you are still at it after so many years! I’m loving the heat too and will smack anyone that complains it’s too hot! 🙂 These cookies are so pretty! I love lavendar and lemon combo. Yay for warmer weather! These pretty cookies are the perfect way to celebrate! Love the lavender and lemon combo! You cracked me up describing your office as “2 degrees.” You sound like me! I am the same way. I FAR prefer heat to cold – I hate being cold, but I don’t mind being warm or hot. Bring it on spring and summer weather! Winter is my least fave for sure. 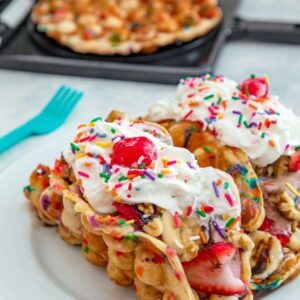 These cookies sound and look TO DIE FOR! These look so beautiful and summery! The flavor combination of lavender and lemon is also so perfect for summer.